As someone with an incurable case of wanderlust, I've long maintained that a good map is the greatest recreational reading there is. Topo maps are especially fascinating for someone enamored of a place as vast as Montana, in part because they reveal so many obscure place names that few of us have ever heard of. 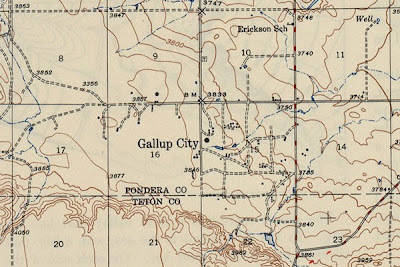 I was looking through a list of old Montana topos recently, for example, and came across one titled "Gallup City" ... a name I didn't recognize at all, though it sounded it at least had the potential to be a fairly big deal. So I downloaded the map and took a look, and there it was, far off the beaten track between Conrad and Choteau. The map was from 1938, and just showed a small maze of random dirt roads and a few buildings ... pretty obviously an old oilfield camp. 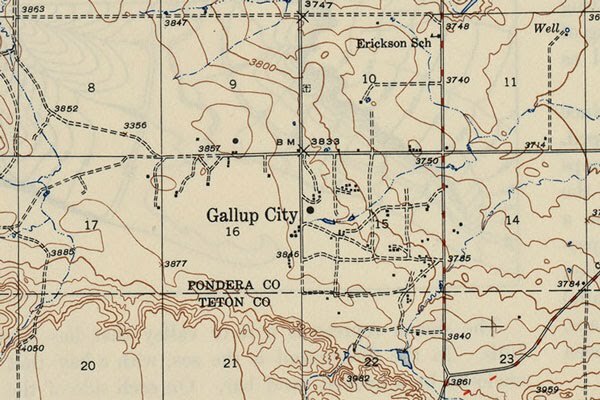 And from the looks of things there's absolutely nothing left of Gallup City today ... but now I still want to drive up there and check the place out sometime.